Early childhood care and education in Canada: Provinces and territories 1998, (4th version) contains detailed material about child care in Canada organized by region. Includes child care services; funding; regulations; number of spaces; parental leave policies; service monitoring and enforcement; history and recent developments. 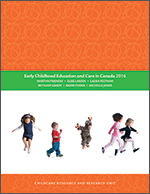 The full text of ECEC in Canada 1998 is available in pdf format from the links below.